The parish of Llanbeblig is bounded on the west by the Menai, on the north by Llanfair Isgaer, Llandeiniolen and Llanrug, on the east by Bettws Garmon, and on the south by Llandwrog, Llanwnda and Llanfaglan. From the town to Bettws the highroad remains in the parish for about four miles, and from north to south Llanbeblig may be about two miles and a half wide upon an average. The general character of the parish is that of a flat dipping downwards to the beds of the rivers, except where it rises into the round and bold rock of Twthill near the town, or swells into the bank near Coedhelen. Near the last is a good show of wood, but in general wood is wanting, and the appearance of the country somewhat desolate. The common of Wern Fawr, covered with little encroachments by the poor, is peculiarly bare. 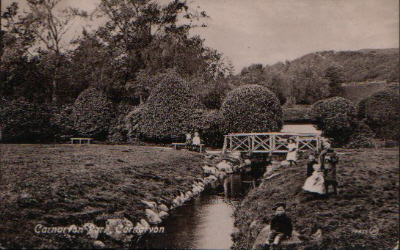 The parish is drained by the Seiont or Rhythallt, by the Gwrfai, and by the little stream which divides it from Llanfair Isgaer. Over this last is a small bridge; another of considerable boldness, already mentioned, on the road to Llanrug, Pont Beblig, Pont y Saint and Pont Newydd. At Pont y Saint is placed the most productive turnpike in the county, let in 1808 for £280. The superior income arises from the carts bringing slates from the Llanllyfni quarries. Of mills, there are not less than six in the parish, two upon the Seiont, three upon the Gwrfai, and one in the town which is worked by a small rill coming down the ravine behind the town. This last frequently experiences a want of water when the ample but shallow mill pond exposes, offensively enough, both to the sight and to the smell a large expanse of mud. Glanrafon, the seat of the Williams, is now in a state of some neglect, although well tenanted. About it is some wood, aged, decayed and of little variety. 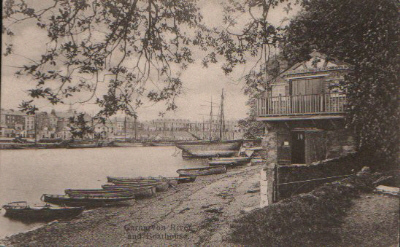 Very unlike are the florid and prosperous plantations of Coed Helen, the seat of Rice Thomas, Esqr., which occupies very beautifully the bank of the river opposite Caernarvon Castle. Of Helen's chapel here and the daughters of Coel Codhebog we have already spoken in Caerhun parish, and the tradition of some lady's having resided here may by some be thought to be strengthened by this preservation of the name. Of the monuments the number is so great as to produce upon our first entrance into the church a sort of confusion at the sight of the assemblage. 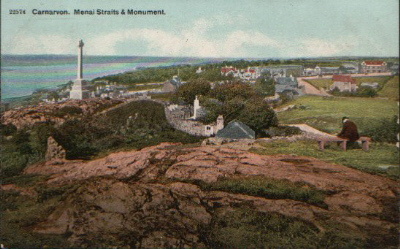 I content myself with noticing those connected with the property of the country, but the advancing commerce and wealth of Caernarvon have enabled many families engaged in trade to place here memorials of their departed relatives. Upon entering by the north transept I observe over the seat belonging to the Garnons of Llanwnda an escutcheon lately raised upon the death of Mrs. Garnons. The shield is gules, the bearings two lions passant, or; and I suspect that a third is concealed by an escutcheon of pretence, which has 1st and 4th, argent, chevron, and three fleur de lys, azure; 2d. and 3d., azure, chevron, and three dolphins, argent. On the south wall beneath one of the above monuments a low arch, or rather series of arches, is pierced, within which is a raised tomb, but I observed neither effigies nor inscription. In the south-west corner of the chancel is a mural monument to Maria Lloyd of Rhyddalt, who died aged 76 in 1784. A brass plate, so obscurely placed as to elude my reading of it, is placed near this to a Foxwist, the arms of whom seem to be a chevron between three cross crosslets, fitchee. To this family are raised several other monuments, one of which is a handsome piece of marble sculpture. Another handsome pyramidical monument records a Williams of Glanrafon, Attorney-General of North Wales, who died aged 63 in 1769. The arms have in chief, or, a chevron between three crows, sable; the field is divided (in a way which I have not before observed) by a line from the dexter chief point to the sinister base point, having or and gules on each side. Over both of these, again, are thrown the chevron and the crows. The day was so dark and the windows so dim that I could but just trace on another shield the three eagles in fess and the Saxons' heads. On the north of the table is a square mural monument to the relict of John Rowlands of Nant, who died in 1718. The arms are 1st and 4th, argent, a chevron, and three crows, sable; 2d and 3d, or, a lion rampant, gules. On...... a brass plate to John Rowlands, son of John Rowlands of Nant and Frances Owen of Porkington, where the arms just mentioned are exactly reversed in the quartering. This field - argent, chevron, and three crows, sable - formed the coat of Llowarch ap Bran (brother-in-law of Owen Gwynedd), a noble tribe who is said to have resided near Holyhead. On the west wall of the chapel, broke out of the chancel's north side, is a monument to Jane, relict of Richard Meyrick of Bodorgan, Esqr., and daughter of Rowland Bulkeley of Porthamel, Esqr., and Mary Owen, sister and coheir of Richard Owen of Penmynydd. She died in 1728 aged 76. The arms are sable, chevron, and three bulls' heads, argent. On a brass plate near this are: crest, phoenix; 1 and 4, three burnt and ragged sticks (borne by the Newborough family) with a chevron and mullet; and 2 and 3, the crows. This is to the memory of Lewis Meyric of Uchedbri in Merionethshire, Attorney-General of the Marches and of North Wales, who died in 1692. On the east wall is recorded Captain John Lloyd of Llangwnadle, who served under James 2, King William and Queen Anne. To many readers these details will, I well know, appear intolerably tedious, if not altogether impertinent. In the transcription I, for my own part, feel considerable pleasure, as my acquaintance with the country enables me as I proceed to see and connect much family history, much family change, and much transfer of property. How much more interesting therefore must the perusal be to those who find among these names and these armorial bearings the association of their kindred, descent and consequence. Waiving any allusion to the labours of my own pen, I may observe that if (in the disputed period and dark gloom of the Wars of the Roses, where so many facts seem to be at almost interminable variance) skilful antiquaries would go into local histories, family papers and monumental records they might still perhaps be able to place those dismal times within the full light of history. The grantees of church property at the time of the Reformation may yet have among their papers and lumber much material for this purpose. I have long cherished the hope, nor can I dismiss the wish. From this digression I return to what is undoubtedly the glory of the church, the alabaster monument of Sir William Griffith and his lady. The tomb upon which the figures are recumbent as large as life is raised about three feet above the two steps, or rather plinths, upon which it stands. They lie on a mat of very good execution, one end of which is rolled up in several convolutions to serve as pillows for the lady and the knight. The same is done, with some variety of shape, at the latter's feet, which rest upon it, while those of the former repose against a lion couchant. At the west end of the tomb three compartments are distinguished, divided by pilasters, and have a sort of architrave about. Five groups of figures facing each other and in the attitude of prayer are seen with much blazonry, among which, as might be expected in the Griffith family, are the Saxons' heads and the heads of stags caboshed. A cross, a crescent and a spear's head were, however, new to me in their combinations with the other bearings. I venture to suppose them the arms of Sir William's first wife, a South Walian. On the north of the tomb are three groups of females praying, all facing towards the east, and these are again separated from each other by the three lions passant and the three eagles in fess, each being twice and in alternate order exhibited upon the pilasters. On the south side we have three compartments separated by four coats on as many pilasters. The 1st compartment shows a warrior armed and one in the weeds of peace, the second a warrior and a lady, the 3d a priest and, I think, two females. All these figures, which are in tolerable preservation and execution, are in prayer and looking towards the east. the arms are' in the following order: 1, Saxons' heads; 2, stags' heads caboshed; 3, three mullets; and 4, stags' heads caboshed with a chevron between. the knight is fully armed, except that he is bare headed and has his hand clasped upon his breast; but these have been broken off. Upon the whole, however, we may feel obliged to the barbarism of the country (some few degrees less, it must be confessed, than that of the English) for having left us so much of this most precious remain without doubt (at least in my opinion) within the country. This Sir William Griffith was, I think, the third in succession in the office of Chamberlain of North Wales from the appointment to it of his grandfather, Sir William Griffith, a gentleman whose name has become famous in the history of the country for his contentions with John ap Meredydd of Istumcegid, chief of the descendants of Owen Gwynedd. The Sir William whose monument we are now viewing was married twice, had nineteen children, and died in 1587. His first wife was Jane, the daughter of Sir Thomas Stradling of St Donats Castle in Glamorganshire; the second was Jane, the daughter of John Puleston, Esqr., Chamberlain of North Wales. By his numerous children the family became connected with the Stanleys of Hooton, the Bulkeley family, with the Phillips of Picton Castle, with the Mostyns, with the Myttons and the Thelwalls, besides numerous other families. Besides this church, where the service is exclusively in Welsh, there is within the town in the north-east angle of the walls a chapel where English only is used. This had for some time been in a state of such neglect and destitution that it has been found necessary to give it a thorough repair, towards doing which the nobility and gentry of the county and of Anglesey have contributed by a prompt and ample subscription. In 1803 we have seen that the total parochial expenditure in poor rates rose to £470.17.1. In 1806 it amounted to no less than £1200; nor has it been since below £900 per annum. On the other hand, the number of houses built within the last ten years in and about the town has been one hundred and seventy; while the encroachments upon the commons may probably amount to above twenty. The vicarage is in the gift of the bishop of Chester, and the tithes are divided in the proportion of one third to the vicar and two to the chapter of Chester, if I am not mistaken in my information. In the parish are, I am informed, two schools, one kept by the Methodists, the other by a person belonging to the church. There are not less than five dissenting congregations: two of Calvinists, one of Independents, one of Wesleyans, and one of Baptists. Lord Newborough is, I have been told, lord of the manor; but whether it be a real or reputed one I have not learnt. 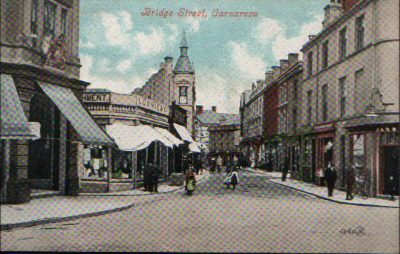 Free Library, corner of Pavillion Hill & Bangor Street. Near the steep (right) bank of the Seiont at a small distance above the castle, is an ancient Roman fort. On two sides the walls are pretty entire; one is seventy four yards long; the other, which points to the river, sixty four yards. The height is ten feet eight inches, the thickness, six feet. Much of the facing is taken away, which discovers the peculiarity of the Roman masonry. It consists of regular courses; the others have the stones disposed in a zig-zag fashion. Along the walls are three parallel rows of round holes not three inches in diameter, nicely plastered, which pass through the whole thickness of the walls. There are other similar holes discovered in the end of the wall, and seen to run through it lengthways. I can neither discover the use of the one nor of the other. Respecting these holes, I have heard it guessed that they were to discharge arrows, to strengthen the wall, to pass the word, etc., but I feel no difficulty in agreeing with Mr. King, who observes in his Monumenta Antiqua that as the Roman mode of building by pouring hot lime in a liquid state upon the wall laid within a frame of wood is well known, it is easily supposed that upon the sufficient induration of the first layer, the boards were raised a stage further in order to repeat the process. Their supports might be mere rounded poles, which when withdrawn in order to go on with the work, would in coming out through the mortar not yet quite hardened, leave the appearance, still remaining, of their being elaborately plastered. With respect to the inference that they pass through the whole thickness of the wall, there is now no evidence of that fact, if there ever was any, for a cane will in none of the holes tried by me penetrate above a foot or two. "Near the corner," Mr. Pennant again speaks,"of one of the walls is a heap of stones, the ruins of a tower, for on digging some years ago the foundations of a round one was discovered. It was paved, and in it were found the horn of a deer and skeletons of some smaller animals, and appears intended to secure a landing place from the Seiont at high water." On the opposite side have been other ruins, it is said, but their existence is now matter of story. With Mr. Pennant I perfectly agree in thinking this curious remain to be shamefully disfigured by the mean buildings and modern patches of wall. Part of the present Grand Jury room was once, I understand, a free school, and the Exchequer stood behind the house of the late Mr. Hugh Ellis in Black Boy Street, round which is supposed to have gone a way called the Church Way. 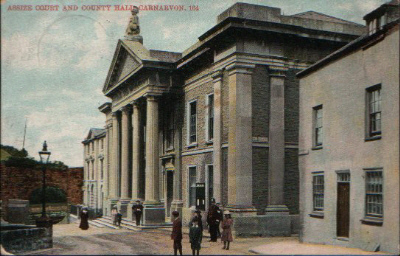 One account assigns the origin of this edifice to Sir William Jones of Castelmark in Llangian after his return from his imprisonment in France, but a much better authority informs me that it was the property if the Griffiths, of whom two were the Chamberlains of North Wales and held their court here. It is now, I believe, the property of Asheton Smith, Esqr., and -quantum mutata!- inhabited by paupers. Plas Pulstone also, though a building of very inferior pretensions, is degraded into an alehouse, the Red Lion, which gives its name to the street. Of the Pulstones mention will be made in the history of the place, but the house, which has on each side of the once spacious fireplace a wooden figure in alto relievo, is now possessed, I am told, by Sir Robert Williams. Plas Issa, belonging to the Thomases of Coedhelen, now taken down, is reported to have been a very handsome old house. 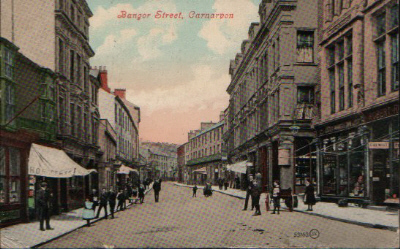 There was also a Plas Bowman and Plas Spicer in Church Street, but of their founders I have obtained no information. 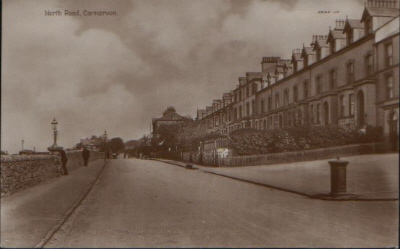 The Sportsman Inn was formerly Quirt House, and belonged to the Williamses of Glanrafon in this parish and of Quirt in Anglesey. 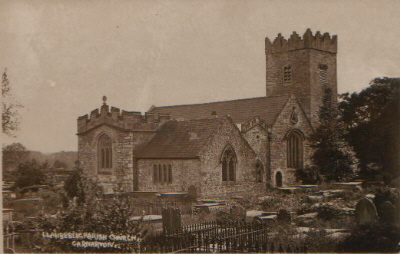 The Quirt estate was once among the possessions of Conway Abbey, and a friend has observed to me that the name, which is not uncommon, may be regarded as good evidence of the place having been church property. 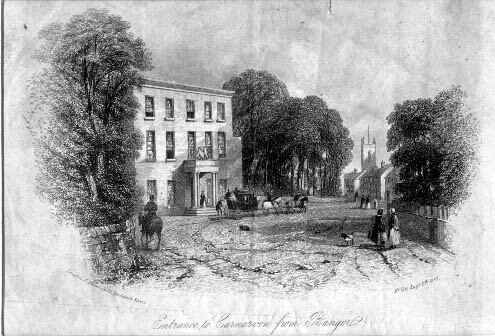 A large new house is the residence of ...... Garnons,* Esqr., by the name of Llanwnda House, taken from the estate in that parish. This family is of English extraction and came into the county with the Parliamentary army under Colonel Twistleton, who also settled at Lleiar in Clynnog, which he obtained by marriage with a daughter of Glynne of Lleiar. *Richard Garnons (1773 - 1841), son of Capt. Richard Garnons who married the daughter and heiress of William Wynne of Plas Llanwnda. The market here, which is held on Saturday, is most excellent, and affords in abundance of butcher's meat, poultry and garden stuff. The supply of fish might be better, but the establishment of a fishing boat with trawls within the last few years promises to improve the market in this respect, as the bay of Caernarvon abounds with the superior sorts of flatfish. 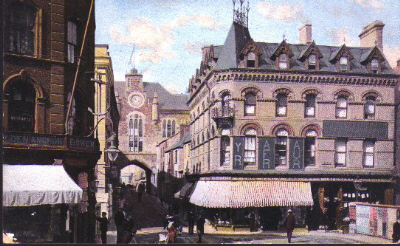 A market house, handsome and substantial, is a recent erection and a great accommodation, although it be somewhat deficient in a full exposure to the air. Above it are kept the arms of the local militia, amounting to about seven hundred men. The town is copiously supplied with water from conduits of an excellent quality, so that the place cannot but be regarded as a very eligible residence for families which wish to unite at once comfort and economy. There are accordingly in general many strangers here, chiefly from Ireland. The shops also numerous and well supplied, and of good medical assistance there is no deficiency. In no respect perhaps is the present generation more advantageously conditioned beyond any preceding one than in the widespread diffusion of medical advice and chirurgical assistance. 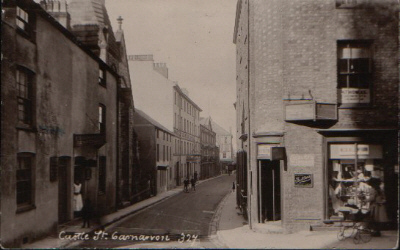 Besides numerous public houses, there are in Caernarvon no less than four inns which keep post chaises. 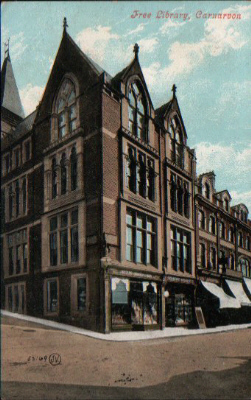 The hotel at the entrance of the town from Bangor Street is a large and well built inn with a suite of offices systematically laid, the property of the Earl of Uxbridge, and now occupied by my worthy friend, Mr. Joseph Wakeman, to whom I here acknowledge myself indebted for much information. 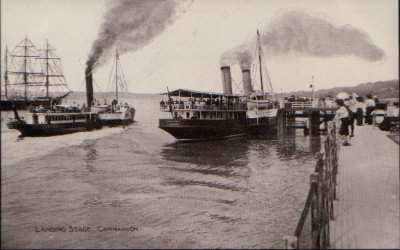 Here is a ferry into Anglesey, for crossing to which a signal is made several times a day by the sounding of a horn. 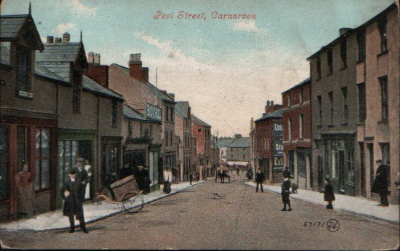 The property of it is, I understand, in Lord Boston, and the rent is stated at seven pound per annum - a return so small that I must apprehend some mistake, for as Caernarvon is the market town of the opposite coasts of the island, where it is the most fertile and best cultivated, the continual communication must give a much greater produce, although the incidental expenses may perhaps be so great as to keep down the rent. Ship building was once carried on here to a considerable extent, but the decay of the accessible timber, together with the general circumstances of the Kingdom, has diminished it so greatly that I do not remember to have seen more than one small vessel at a time upon the stocks. 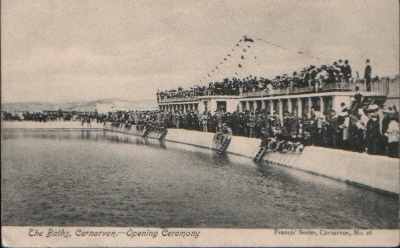 The harbour may be considered as formed by the mouth of the Seiont, which flows along the quay below the castle, and at high water is capable of floating the largest class of briggs. Vessels, however, lie in the Strait or above the town, and their numbers are generally so great as to imply a considerable traffic. 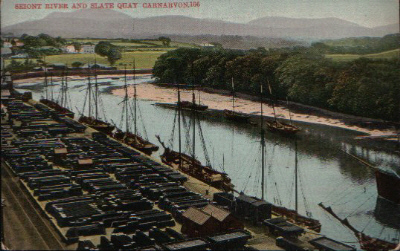 The exports are slate, the chief branch of trade; some provisions, copper, a few bales of paper made in Llanrug, and a small quantity of coarse cloth. The imports are groceries, liquor, the various articles of supply for the shops, and coals. Under a recent Act of Parliament a new quay above the former one is in a course of construction, but as far as my observation has gone its progress is very slow. The navigation of the Menai is exceedingly impeded by the bar at its mouth, which is not only nearly a shoal at low water, but is exposed to continual shifting insomuch that it is part of the Custom House duty to survey and buoy it afresh after almost every gale of wind. 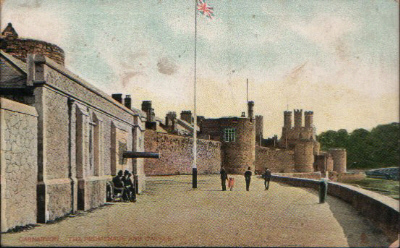 The Custom House itself is a small building without the wall, and situated close under the castle near the water. In descending from the times of the Romans, we dimly find our way, if we do not rather make it, through the obscurity until we begin to discern that sort of twinkling light which a bare enumeration of names is calculated to supply. 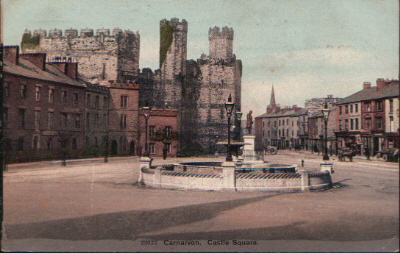 With that of Cadvan ap Iago, King of North Wales, sixth in descent from Caswallon Law Hir, the seat of Caernarvon becomes connected in the beginning of the seventh century, when this place was selected by him as his royal residence. 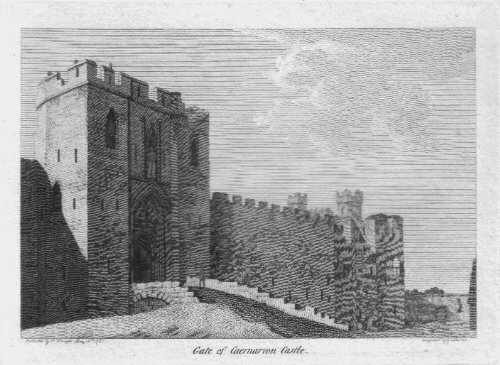 The present name occurs in Giraldus Cambrensis, and in a charter dated from it by Llewellyn in 1221; but Mr. Pennant suspects that the actual site of the present town and castle owe their origin to Edward 1. 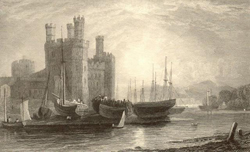 The castle was commenced in 1282, and being assiduously worked upon by the compelled labour of the natives, was completed, it is supposed, about the end of the ensuing year, for in April, 1284, Queen Eleanor was here delivered of the hapless Edward of Caernarvon. The architect, Henry Ellerton, and the master workmen Mr. Pennant very reasonably suspects to have been Anglo-Norman, as the desultory life and rude manners of the Welsh would scarcely have allowed them to entertain the suggestion of a building so ample and magnificent. the materials of its construction are limestone and pudding stone, the former of which is said- and doubtless with truth- to have been brought from Anglesey, and the latter from near Vaenol. Without denying this, I may observe that the material is also found in considerable abundance along the Menai above Bangor Ferry. That the building was of such a solid construction as its purposes required, time has amply disproved, for the touches of this quiet but corroding enemy are periodically bringing down masses of the facings, etc., while Conway with a rigid unyieldingness still bids them defiance. 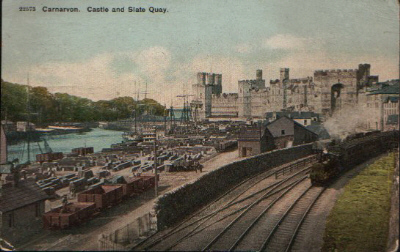 Between these two great fortresses I have already alluded to the frequent comparisons instituted; but although I without hesitation give the preference to Conway as a whole, into the composition of which the surrounding scenery enters, yet upon the abstract consideration of the building alone I cannot but allow the superiority of Caernarvon. In exactly appreciating the difference I feel some difficulty as to its perception, and more in its expression; but I am on the whole inclined to refer my sense of Caernarvon's greater beauty and more imposing effect to its superior site and to the angular shape of its towers. The first must strike everyone; the last may be regarded as matter of mere taste, but a friend, who to his other acquirements adds the full command of a very masterly pencil, made me observe how much more attractively fall the light and shades upon the faces of an angular building than upon the surface of one having a circular form. In both the same artifice of drawing from the more massive tower the long and slender turrets is practised with an effect quite beautiful and almost magical. The form of this noble castle is an oblong one hundred and twenty yards in length by sixty in width, with a tendency to form an obtuse angle outwardly towards the middle. 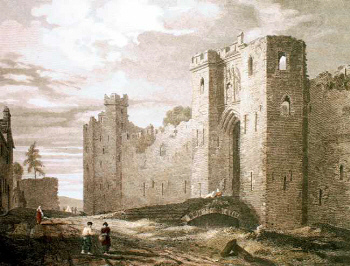 The portal, having over it the mutilated figure of the founder, and looking towards the town, is magnificently placed between two vast towers exposing each of their three external faces, and connected by their curtains with the flanking towers at the corners. We enter: we behold on each side of us the dark and gloomy appartments within the towers, and as we cast our eyes upwards we behold the multiplied precautions of defence in a succession of portcullis grooves. Passing these, we are in the area, and for a while are involved in the opposite feelings of sorrow and admiration. The Great Hall has disappeared, and the contrivances for its service are reduced to a broken stone cistern and a piece of leaden pipe which just shows itself at the opening of its stone channel. the chapel is down, and beneath the heap of rubbish which swells up to the Queen's Gate its ruins may perhaps be one day uncovered. A line along the walls just serves to mark where were the barracks for the garrison, and the foundation wall, upon which we stand to make these observations, shows where the whole area was heretofore divided into a double court. The spiral stairs are for the most part ruined, and one single window frame remains as a pattern of what the others might have been. In the south front the Queen's Gate (an exquisite specimen of architecture), once entered by a drawbridge over a fosse now enlarged into a spacious hollow by the removal of the bank, is suspended on high with the appearance and the effect of a large window. Westwards the whole length of the curtains between the towers and hanging over the river is traversed by a covered gallery whence arrows and cross bows might be discharged through the slits. Towards the north are the royal, or governor's, apartments, looking inwards upon the court, and disposed in somewhat of the shape of a parallelogram. But the most conspicuous feature of the whole is the Eagle tower, so named from the figure of an eagle in stone surmounting one of its battlements. within this part of the castle Queen Elinor was delivered, but whether in the larger circular apartment or a dark adjacent closet has been made matter of some controversy. Into this I shall not enter, but I may remark that there seems to be little force in any argument drawn from the superior comfort of one room over another, as with a sense of either comfort or convenience the king and his lady were both probably equally unacquainted. With respect to the king's promise of giving to his new subjects a prince who spoke no other language, I advert to it merely to express my opinion that no deceit was intended on the one hand, or supposed on the other, It appears to me to have been a handsome and gentlemanly mode of signifying to the Welsh nobles that they were for the future to look for their prince in the English court. A conciliatory expression must have helped to sooth the harshness of the fact, and at the present hour the Principality may proudly rejoice at having its royal representative planted upon the second step of the British throne. The best point of view for taking in at one glance the greatest extent of the castle wall is just below the old Roman fort already mentioned, and is in fact the one selected by Wilson for his representation of it. From the sea the effect is not good, as the whole, rest upon a dead level line. The history, taken from Mr. Pennant, I shall just touch and hastily relinquish. The first governor it appears, was John de Havering with a salary of two hundred marks, with which he bound himself to maintain constantly, besides his own family, fourscore men, of which fifteen were to be crossbow men, one chaplain, one surgeon and one smith; the rest were to do the duty of keepers of the gates, sentinels and other necessary offices. In 1289 I find, says Mr. Pennant, that the king had appointed Adam de Wetenhall to the same important office. 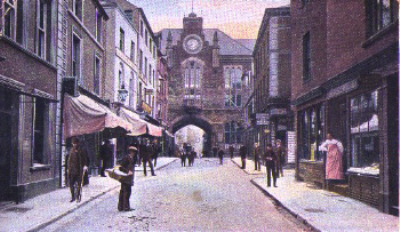 The establishment for town and castle was as follows: the constable of the castle had sometimes £60, sometimes £40 a year; the captain of the town had £12.3.4 for his annual fee; but this office was sometimes annexed to the former. The constable and the captain had twenty four soldiers allowed them for the defence of the place at the wages of 4d. per day each. The porters of the town had a stipend of £3.10.0. Mr. Pennant naturally expresses his wonder at the slenderness of the garrison, which he seems to infer must have been reinforced during hostilities. Slender however as it was, I should have supposed it sufficient with the help of the townsmen to repel the feeble attacks of an unequipped enemy. 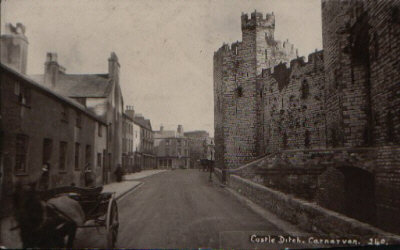 Such however was not the case, for in 1294 the Welsh under Madoc surprised the town during a fair, and if we may believe Mr. Carte, also mastered the castle. The latter fact I am extremely inclined to doubt. It was not until after the long lapse of time between the last date and the year 1644 that history has traced the conquest of this place, though it was abundantly harrassed in the wars of Glendwr. In the year last mentioned it was seized by the Parliamentarians, but was again repossessed by the Royalists under Lord Byron. 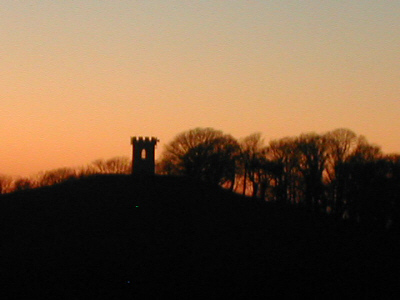 It was again taken by Mytton in 1646, who with Colonel Mason was besieged by Sir John Owen in 1648. Of the latter gentleman's disastrous fate in the battle of Llandegai, whither he marched to meet Colonel Twistleton, we have already read. The marks of these hostilities seem traceable in the shattered appearance of the walls facing over the Seiont. The batteries were probably raised on the opposite side if the river, and from the balls picked up occasionally at Conway we may suppose that the artillery employed consisted of not more than four pounders. 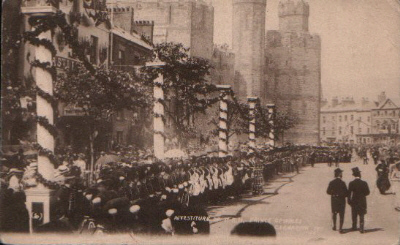 Upon the total removal of the government of North Wales instituted by Edward the First after the conquest by the Statute of Wales in the reign of Henry 8, the judicial arrangements took place which have since continued. In this, as the county town, the quarter sessions and the great sessions or assizes are held, with the reserved power, however, of transferring to the nearest English assize town, Shrewsbury, any trial in which the partiality of a native jury may be suspected. On the Crown side many years have now passed since a conviction, followed by execution, has been known, and the horror of the law's extreme punishment is so great that the apprehension of it among the lower orders appears to be almost intolerable. Upon this disposition many strangers have been inclined to fasten the imputation that acquittals more frequently originate in the morbid tenderness than in the actual innocence of the accused. That there is some truth in the remark I am ready to allow, but candour perhaps will rather turn to the converse of the proposition and observe that the rarity of offence has induced the tenderness rather than that the tenderness has produced the impunity. In fact cases of atrocity very rarely occur, nor even of the more serious violations of property are the instances numerous. 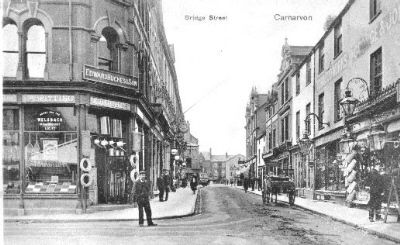 For my own part, I am prepared from my own observation and the opinions of many candid and intelligent persons to believe that in their present stage of society the inhabitants of Caernarvonshire form a very decent, civil, pious and well-ordered people. 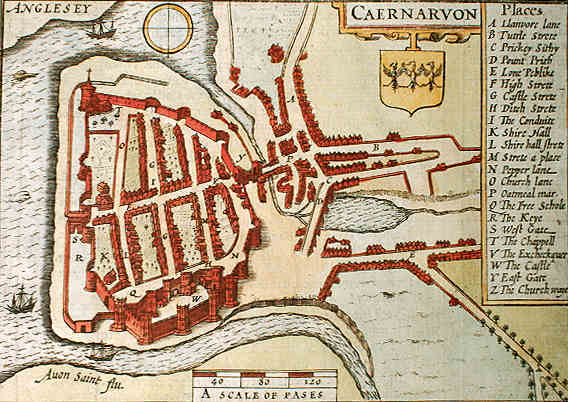 Caernarvon was made a borough town by a charter of Edward the First, and with a concession very unlike the wise provision in the Statute of Wales, granted to its inhabitants the strange privilege of being tried by a jury of their townsmen alone for all offences committed between the Conway and Dyfy. The corporation consists of a mayor, created, according to Mr. Pennant by a patent; the governor of the castle, of an alderman, of two bailiffs, of a town clerk, and of two serjeants-at-mace. Here also is maintained the record office, in which, according to the return in answer to the queries proposed by Government, the utmost exactness and facility of information prevail. With the contributory boroughs of Conway, Nefyn, Pwllheli and Criccieth this town returns a representative to Parliament, whither also the county sends, like the other Welsh counties, a single member. 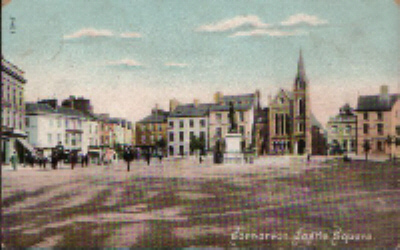 The right of suffrage is said to be in every freeman resident or otherwise, The first member was John Puleston, and when after the lapse of many years a second mission of representatives in the reign of Edward 6 took place, both county and borough gave the preference to gentlemen of that family. for seven more .. .. .. .. .. .. .. .. .. .. .. .. .. .. .. .. .. .. .. .. .. .. .. .. .. .. .. .. .. .. .. .. .. .. .. .. .. .. .. .. .. .. .. .. .. .. .. .. .. .. .. .. .. .. .. .. .. .. .. .. .. .. .. .. .. .. .. .. .. .. .. The ale drinking does not seem to have been in the proportion of Falstaff's sack to his bread, as it is no more than .. .. .. .. .. .. .. .. .. .. .. .. .. .. .. .. .. .. .. .. The charge for white wine on that night is not less than .. .. .. .. .. .. .. .. .. .. .. .. .. .. .. .. .. .. .. .. .. .. .. .. .. .. .. .. .. .. .. .. .. .. .. .. .. .. .. .. .. .. .. .. .. .. .. .. .. ..
On Wednesday's dinner the drinking is unexpectedly moderate: ale .. .. .. .. .. .. .. .. .. .. .. .. .. .. .. .. .. .. .. .. .. .. .. .. .. .. .. .. .. .. .. .. .. .. .. .. .. .. .. .. .. .. .. .. ..
wine .. .. .. .. .. .. .. .. .. .. .. .. .. .. .. .. .. .. .. .. .. .. .. .. .. .. .. .. .. .. .. .. .. .. .. .. .. .. .. .. .. .. .. .. .. .. .. .. .. .. .. .. .. .. .. .. .. .. .. .. .. .. .. .. .. .. .. .. .. .. .. .. .. .. .. .. The diet of 150 men, of whom 11 pay a shilling each, is .. .. .. .. .. .. .. .. .. .. .. .. .. .. .. .. .. .. .. .. .. .. .. .. .. .. .. .. .. .. .. .. .. .. .. .. .. .. .. .. .. .. .. .. .. .. .. .. .. .. The dinner however seems to have done its business, for at supper I find diet for 12 men .. .. .. .. .. .. .. .. .. .. .. .. .. .. .. .. .. .. .. .. .. .. .. .. .. .. .. .. .. .. .. .. ..
drink .. .. .. .. .. .. .. .. .. .. .. .. .. .. .. .. .. .. .. .. .. .. .. .. .. .. .. .. .. .. .. .. .. .. .. .. .. .. .. .. .. .. .. .. .. .. .. .. .. .. .. .. .. .. .. .. .. .. .. .. .. .. .. .. .. .. .. .. .. .. .. .. .. .. .. ..
On Thursday the voters seem to flag, for at dinner there are only nine men, whose diet is .. .. .. .. .. .. .. .. .. .. .. .. .. .. .. .. .. .. .. .. .. .. .. .. .. .. .. .. .. .. .. .. ..
At supper the nine are reduced to four, whose diet is .. .. .. .. .. .. .. .. .. .. .. .. .. .. .. .. .. .. .. .. .. .. .. .. .. .. .. .. .. .. .. .. .. .. .. .. .. .. .. .. .. .. .. .. .. .. .. .. .. .. ..
On Friday we seem to be winding up the accounts, for exclusive of the drink and diet of seventeen men at .. .. .. .. .. .. .. .. .. .. .. .. .. .. .. .. .. .. .. .. .. .. .. ..
the cook has (for remuneration I suppose) .. .. .. .. .. .. .. .. .. .. .. .. .. .. .. .. .. .. .. .. .. .. .. .. .. .. .. .. .. .. .. .. .. .. .. .. .. .. .. .. .. .. .. .. .. .. .. .. .. .. .. .. .. .. .. .. ..
four maids do. .. .. .. .. .. .. .. .. .. .. .. .. .. .. .. .. .. .. .. .. .. .. .. .. .. .. .. .. .. .. .. .. .. .. .. .. .. .. .. .. .. .. .. .. .. .. .. .. .. .. .. .. .. .. .. .. .. .. .. .. .. .. .. .. .. .. .. .. .. .. ..
the ostlers .. .. .. .. .. .. .. .. .. .. .. .. .. .. .. .. .. .. .. .. .. .. .. .. .. .. .. .. .. .. .. .. .. .. .. .. .. .. .. .. .. .. .. .. .. .. .. .. .. .. .. .. .. .. .. .. .. .. .. .. .. .. .. .. .. .. .. .. .. .. .. .. ..
Next follows a charge for the horses, ten of which in the stable for a night pay each .. .. .. .. .. .. .. .. .. .. .. .. .. .. .. .. .. .. .. .. .. .. .. .. .. .. .. .. .. .. .. .. .. .. ..
nor do those in the field cost less, as thirty are charged .. .. .. .. .. .. .. .. .. .. .. .. .. .. .. .. .. .. .. .. .. .. .. .. .. .. .. .. .. .. .. .. .. .. .. .. .. .. .. .. .. .. .. .. .. .. .. .. .. ..
seventy six .. .. .. .. .. .. .. .. .. .. .. .. .. .. .. .. .. .. .. .. .. .. .. .. .. .. .. .. .. .. .. .. .. .. .. .. .. .. .. .. .. .. .. .. .. .. .. .. .. .. .. .. .. .. .. .. .. .. .. .. .. .. .. .. .. .. .. .. .. .. .. .. ..
fifty four .. .. .. .. .. .. .. .. .. .. .. .. .. .. .. .. .. .. .. .. .. .. .. .. .. .. .. .. .. .. .. .. .. .. .. .. .. .. .. .. .. .. .. .. .. .. .. .. .. .. .. .. .. .. .. .. .. .. .. .. .. .. .. .. .. .. .. .. .. .. .. .. .. .. Some extra sums for single articles are then mentioned, of which I shall notice those which give specific prices as for two wethers .. .. .. .. .. .. .. .. .. .. .. ..
28lb. of cheese .. .. .. .. .. .. .. .. .. .. .. .. .. .. .. .. .. .. .. .. .. .. .. .. .. .. .. .. .. .. .. .. .. .. .. .. .. .. .. .. .. .. .. .. .. .. .. .. .. .. .. .. .. .. .. .. .. .. .. .. .. .. .. .. .. .. .. .. .. .. ..
demolished to give a clear view of Queen Eleanor's Gate at the Investiture of 1911. The present lord lieutenant of the county is Lord Viscount Bulkeley, and the number of the old militia is ninety five, of which Richard Edwards of Nanhoron, Esqr., is colonel. To the state of dissent from the Church I have so continually paid attention, that in this place I shall confine myself to the notice to the sect of Methodists called the Jumpers, whose periodical rendezvous within the county was Caernarvon while they still continued to celebrate their assemblies. Once and only once I have beheld the fantastical proceedings of these religionists, whose first care seems to be the erection of a pulpit, tribune and a due provision of preachers, able-bodied and having good lungs. As fatigue or any other calls succeed, the harangeur leaves his place, which is immediately occupied by a successor, and thus the stimulus of fanaticism is kept in full action until its effects are spread throughout the congregation. Ejaculations and sighs are first heard, then succeed an accuring murmur of groans, until at length the mass assembled swells into a storm of prayers and wild expression and jumping. The passion endured, the excitement and the fatigue ultimately produce an effect debasing to our nature and most disquieting to the bystander. Some are sick, some faint, some fall; and as they are led off, the women more particularly, the imagination seizes what may be supposed to be the appearance of a knot of witches exhausted by the orgies of their Sabbath's celebration. In narrowing these scandalous scenes ridicule has for once been beneficially employed, and the possessors of this abominable mummery are, I am informed, rapidly declining in numbers. With respect to the charge brought against these people for profligate licentiousness of conduct during the night of their assemblies, I shall upon general grounds require the very strictest proofs before I would give credence to its existence, and above all to the manner of its existence. *Castell Bach, "Little Castle", is situated on top of a low hill on the Coed Helen Estate. It was built in the early Victorian period as a summerhouse by landowner Rice Thomas Esq. 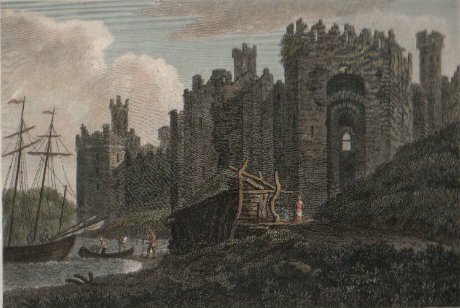 The above piece is taken from "A Description of Caernarvonshire (1809 - 1811), by Edmund Hyde Hall, and published by the Caernarvonshire Historical Society in 1952. The original manuscript is at the Library of the University of Wales (Bangor MS No. 908).